Usher is one of the pop world’s great dancers (a skill he showed off on Broadway during a 2006 limited engagement as Billy Flynn in Chicago), so it makes perfect sense for him to spend a Saturday night out at Traces, the eye-popping off-Broadway dance and acrobatic spectacle. On February 25, the superstar singer made his way to the Union Square Theatre to see this high-flying show, and Broadway.com was on hand to capture a hot shot of the cast and their famous visitor. 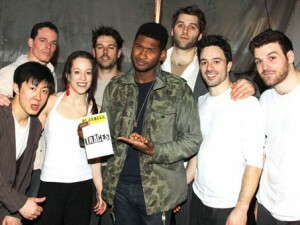 If you haven’t seen Traces, follow Usher’s lead and get tickets!